À la Bécasse is a great place. 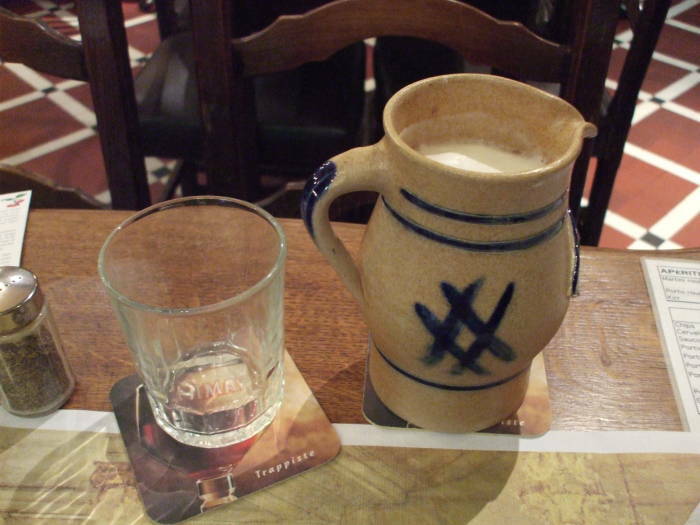 It is one of the few places in the world where you can get lambic served in stoneware jugs in the true traditional way. It's a fairly small place, one rectangular room. A clean, well-lighted place as Papa said, with dark wood paneling, blue and white tiles, and long narrow tables with straight-backed wooden chairs. Qu'est-ce que c'est, «à la bécasse»? It means "in the woodcock." Good cafe, strange name. 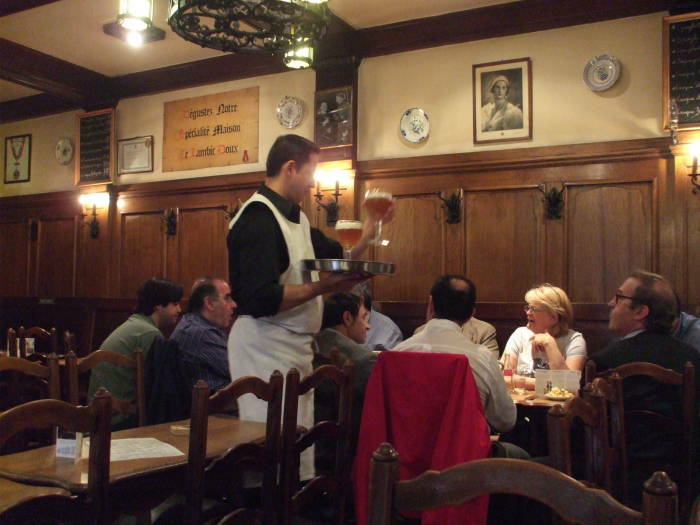 As I said on the introductory page, traditional Belgian beer cafes aren't rowdy sports bars. 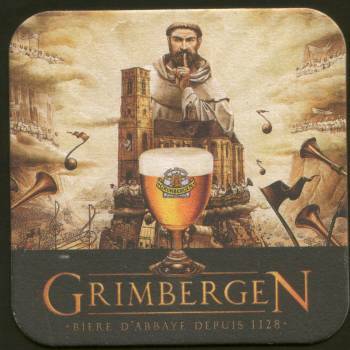 They're about sipping the wide variety of Belgian brewed products. 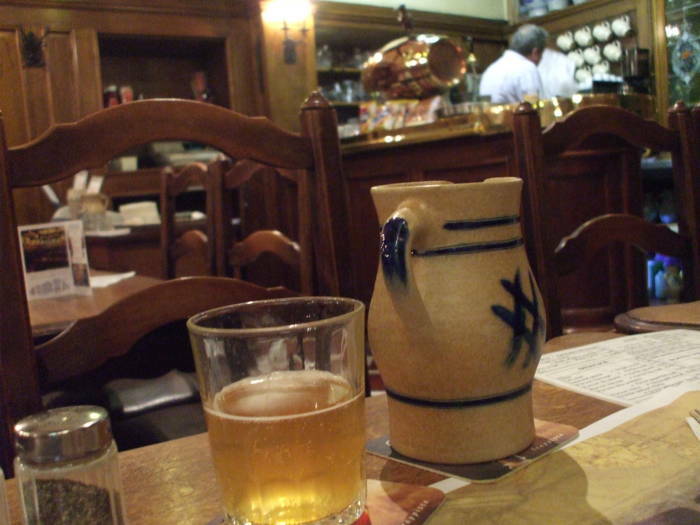 And jugs of lambic are as traditional as the beer scene gets. It's easy to find, if you know where to look. 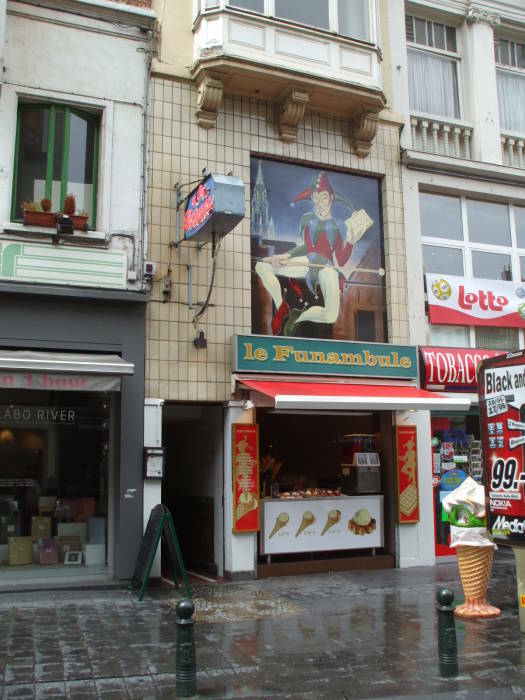 It's at 11 rue de Tabora, across from St-Nicholas church, just two blocks from the Grand Place. 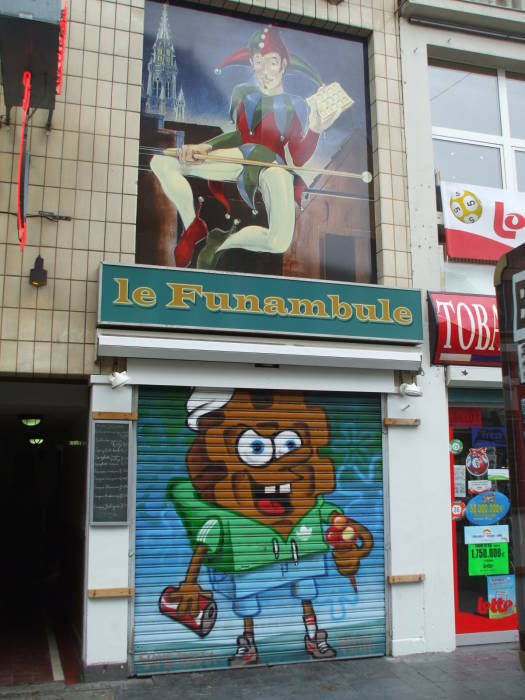 It's just around the corner from the Bourse, which itself is on the main north-south street through the Lower Town. Google Maps can even find it! A neon sign announces the name. 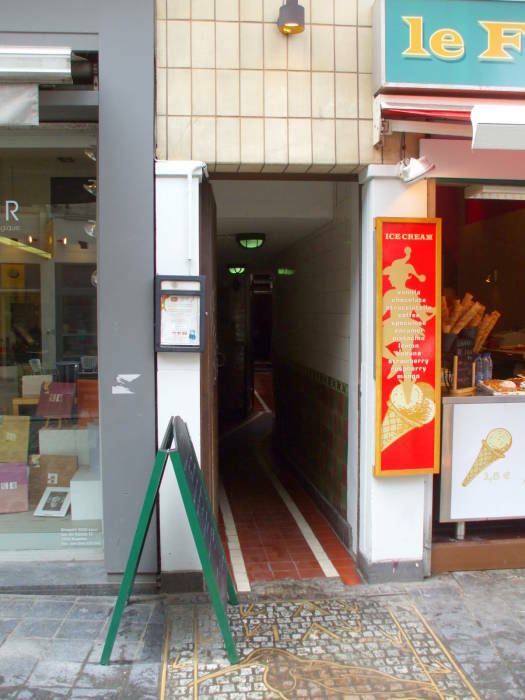 The sign is above a narrow doorway leading into a small passageway. The waffle shop next door is far more prominent, especially when it's closed and Spongebob Squarewaffle appears on their roll-down steel door. This is the place, walk back through that passageway. It opens up and leads to the cafe entrance. Yes, this is definitely the place. 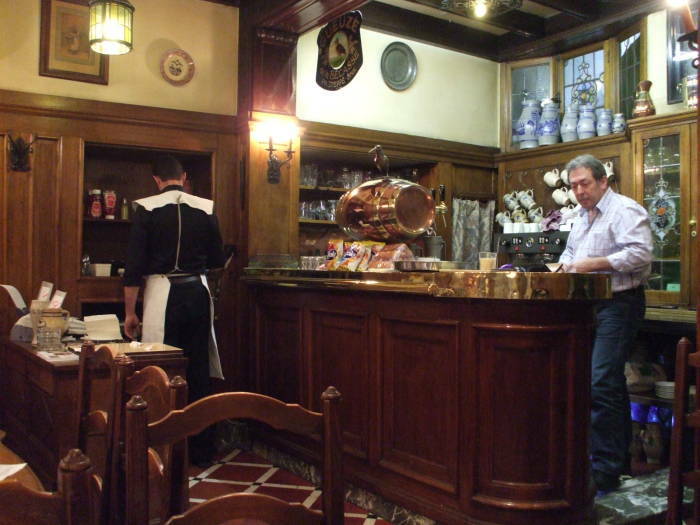 Look at all the shining brass and copper on the bar and taps, and the cabinets stocked with stoneware jugs. The wait staff dresses traditionally. This cafe's atmosphere is that of an earlier era. 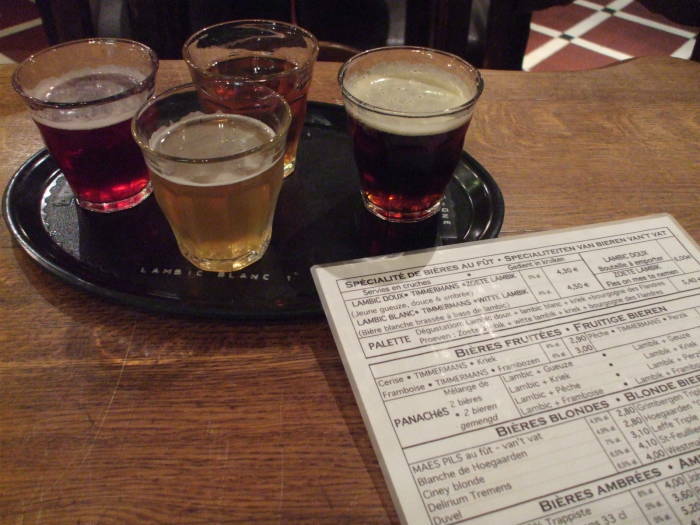 With very little experience in the exotic world of lambic and gueze, what should I get? Kriek, or cherry lambic. This isn't my favorite style, but I liked this one much better than other kriek I've had. Maybe it was the atmosphere. Lambic Blanc or Witte Lambik (White Lambic), described as bière blanc brassée à base de lambic. This one was my favorite. 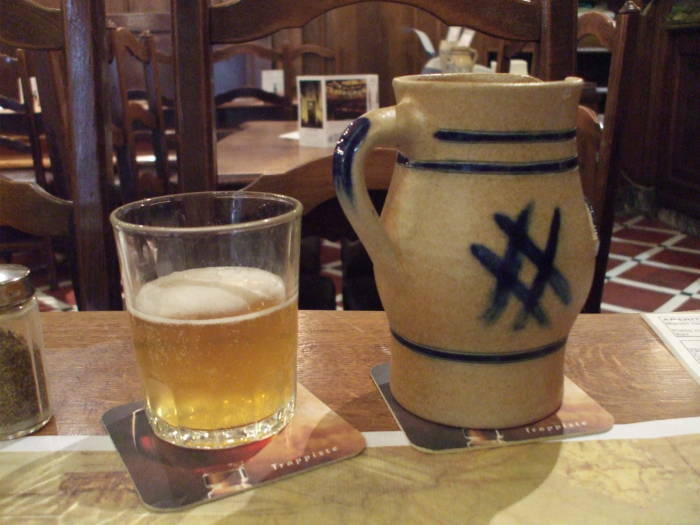 Lambic Doux or Zoete Lambik (Sweet Lambic), described as jeune gueuze, douce et ambrée. It certainly was sweet, a little too sweet for my taste. 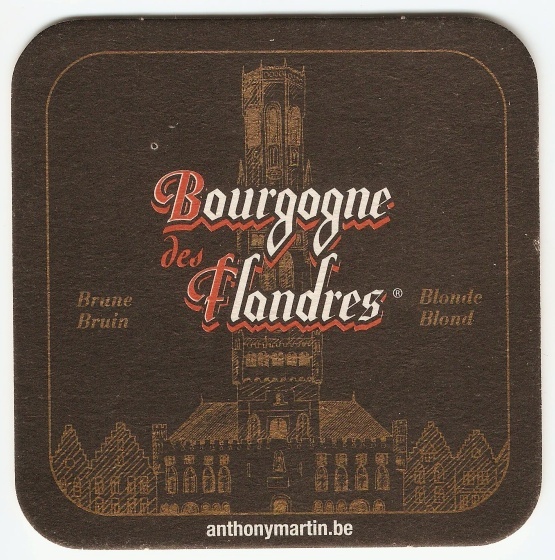 Bourgogne de Flandres. Good, but a bit ordinary in comparison to the others. The pallette had shown that the lambic blanc was my favorite, so I got a pichet of that. It's just a simple stoneware jug and a small straight-sided glass. 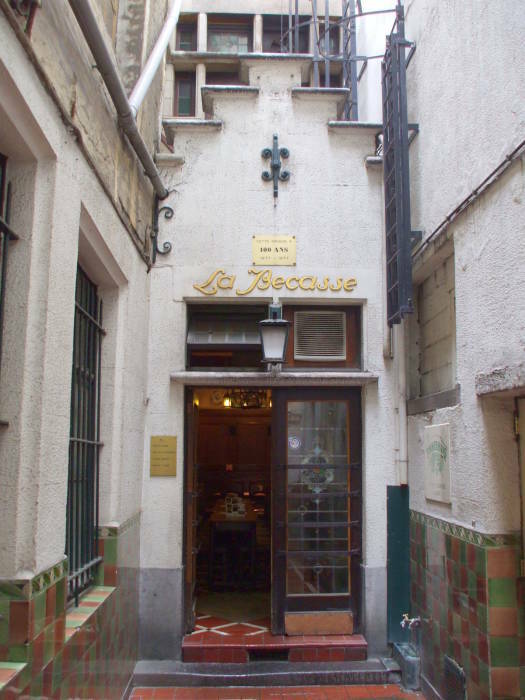 Unlike some cafes, à la Bécasse offers some full meals. 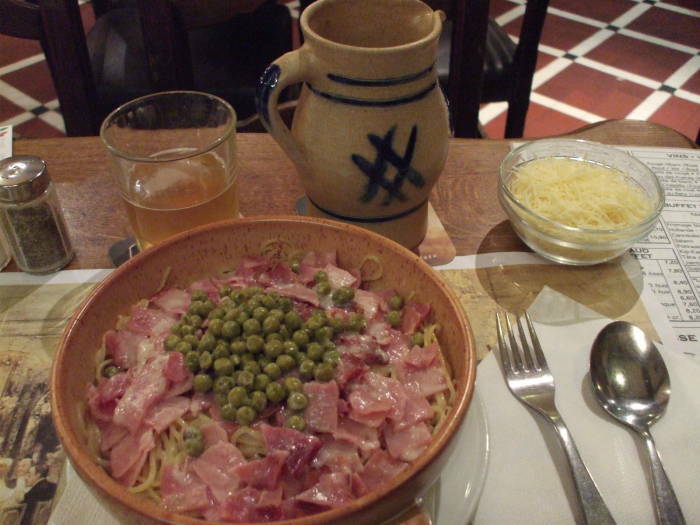 I got the spaghetti maison, which was a big bowl of pasta with milk in the bottom, and layers of cheese, smoked ham, and peas on top. Now it's time to go to the next cafe!